Former Fed Chair Alan Greenspan gave a wide-ranging interview with CNBC on Friday, where he acknowledged just how closely the U.S. economy and stock market are tied together. Greenspan’s rare revelation offers insight into why President Donald Trump is again urging the Fed to lower interest rates and even resume quantitative easing (QE), a controversial monetary policy that pumps new money into the economy and has only been tried once, during the Great Recession. It was then considered a last resort to get the economy going again. Now that the economy is supposedly booming, it seems odd that Trump would call for QE. Generally during a recession, you borrow to get out. When the economy is booming, you pay down the debt. But here we are, with the national debt and deficits skyrocketing while the president calls for recession-era stimulus during good economic times. “If the Fed had done its job properly, which it has not, the Stock Market would have been up 5000 to 10,000 additional points, and GDP would have been well over 4% instead of 3%…with almost no inflation. Quantitative tightening was a killer, should have done the exact opposite!” Trump recently tweeted. 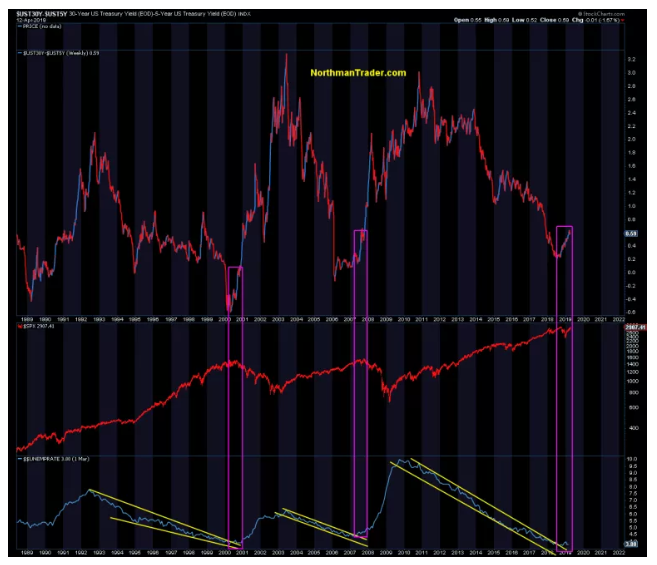 If only we had QE4 we could grow at 4% and the $DJIA would be at 31K-36K. Part of this statement is of course political calculus. After all someone has to be blamed if growth slows ahead of the US election, may as well blame the Fed, not self initiated trade wars or tax cuts. Yet the president of the United States has now squarely made central bank policy responsible for not only the direction of equity markets, but also their levels and directly linked the Fed’s policy to GDP growth. But in context of the upcoming 2020 election the tweet makes sense as he of course doesn’t want to see markets falter into the 2020 election. Two: But Alan also acknowledges the larger economy is in massive trouble and by extension, markets. A short term boost he calls the current rally with growth faltering in the long term. Key reasons: Slowing growth in Europe and substantial fiscal problems related to entitlements, which are rising and will continue to rise due to the demographic picture which can’t be changed. Add an “awful” political climate and you have a structural drag on the economy that Alan sees fading “dramatically”. Three: The spread in the yield of the 30-year and 5-year. Alan Greenspan sees that as a key measure of the degree of willingness on the part of corporate management to make investments in the longer run. That curve hasn’t inverted, but it exhibits behavior similar to previous pre-recession periods when unemployment was at a cycle low. 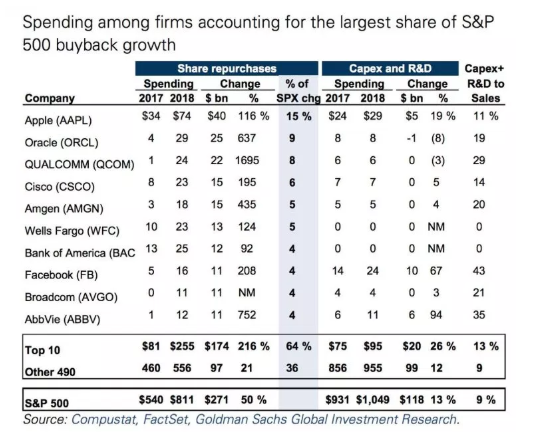 While 10 firms made up 31% of all buybacks in 2018 (according to Goldman) Apple has spent $74 billion on share buybacks, 2.5 times more than it spent on Capex + R&D. Overall buyback growth in 2018 was way higher than Capex growth. Certainly says a lot about priorities. 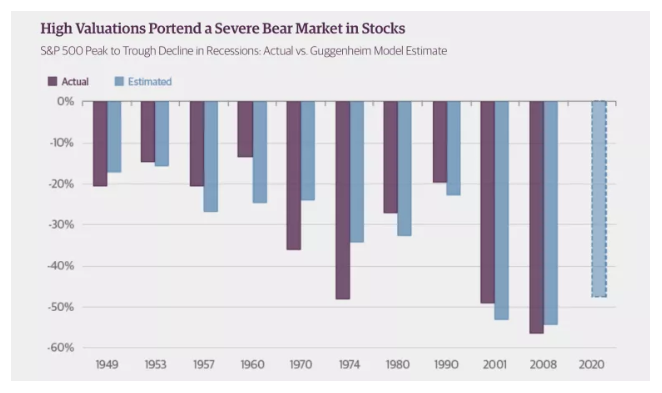 In conjunction with the charts posted this weekend in Mind the Gaps, this screams 2020 recession risk to me and if so, buybacks will disappear quickly when that reality sinks in perhaps later in the year. That’s a lot of GDP takedown given Alan Greenspan’s ratio outlined above. The larger message: In essence Al is affirming my Combustion case, that it all will end badly and that the current rally will not last.